As an African-American he has no chance to break through into the mainstream, so he performs mainly for black audiences. He does, however, make several trips to Chicago, and even plays piano for the customers at the lily-white Everleigh Club–the most expensive brothel in town. The Everleigh Sisters consider themselves “open minded” in this regard, and even allow heavyweight boxing champion Jack Johnson to become a customer. (Johnson will later run away with one of the “girls” from the Everleigh Club). Despite his reputation, Joplin is already beginning to lose the ability to play piano. He has contracted syphilis, and it is slowly eating away at his brain. A full-fledged dementia will set in by 1916, and he’ll die in 1917. *The last emperor of China is named—-a 3-year-old boy. (They should really make a movie about that). 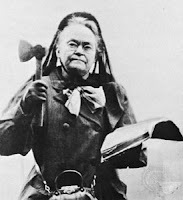 *Carrie Nation (Nov 25), a leader of the temperance movement, turns 62. The large woman (6 feet, 175 pounds) spends her time smashing up bars with a hatchet, because thinks of herself as a “A bulldog running along at the feet of Jesus, barking at what He doesn’t like.” She lives in Kansas, and will die in 1911–nine years before her dream of Prohibition is realized. *Busby Berkley turns 13 (Nov 29) in Los Angeles. *Winston Churchill turns 34 (Nov 30). He is a newlywed, and his wife is pregnant with their first child. Churchill has just been named to the cabinet as the President of the Board of Trade. 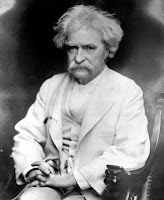 *Mark Twain turns 72 (Nov 30) in Connecticut. He is very depressed because his wife and daughter recently died, and another daughter is very ill. She will die next year at the age of 28. Twain himself only lives another year and a half; passing away on April 21, 1910, one day after Haley’s Comet makes it’s closest approach to Earth. If you go back in time, visit Atlantic City and see the streets from the game of Monopoly. The streets already exist, the game won’t exist until 1933.